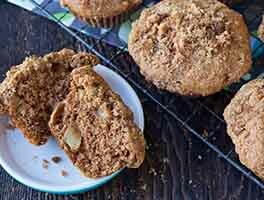 This recipe, a throwback to the "back to the land" '60s, brings together all kinds of fruits and vegetables in an earthy whole-grain muffin that, despite the description, manages to taste very good indeed. Moist and just sweet enough, Morning Glory are a great "eat in the car" treat. 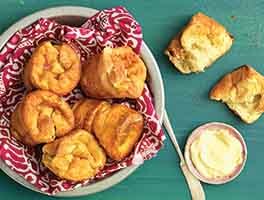 They need the enhancement of neither butter nor jam (though either — or cream cheese — wouldn't be out of place). 40 mins. to 53 mins. Not fond of raisins? Substitute Substitute Jammy Bits, sweet, soft little morsels of fruit purée. Delicious! I used fermented carrot kraut that I'd made and subbed flax seeds for the wheat germ/sunflower seeds. In the future, I'd add more raisins. These are wonderful. I too, got about 17-18 based on the size of my muffin tin. But needed, then, to reduce the baking time. They're hearty and not too sweet. They dome nicely. New favorite. 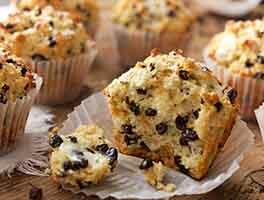 Excellent muffins. I didn't have any apples on hand so I used cranberry. Delicious!!! 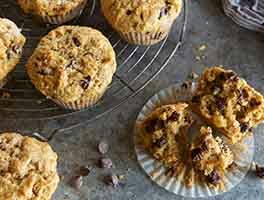 On my regular list as a go to nutritious and tasty muffin, even my husband liked them and he is a very picky eater. Thank you so much for sharing. Recipe is awesome, rave reviews from various people who tried them. Passed along recipe and website. Few thoughts on this recipe: 1. 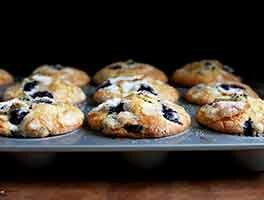 These muffins are delicious. 2. I substituted fresh lemon juice for orange juice. 3. I had a hard time really discerning if I had enough carrots and apples. I know it says 1 large apple and 2 cups of carrots. It just seemed like ALOT of carrots for 12 muffins. 4. Others mentioned the recipe makes a lot of batter. I agree with that. The batter overflowed on the muffin tin to make really beautiful muffin tops (most recipes I find don't turn out like that). Made this exactly as directed, and I wish I could rank this recipe as 6 stars, it's that good. Why would anyone buy a muffin at a shop when you can make these? I love these muffins. I have made them as is and they're delicious, but I have also halved the sugar and used a mushed ripe banana in its place and they're still very sweet and moist. I tend to use coconut oil to accent the shredded coconut, craisins instead of raisins, pecans in place of the seeds. and add blueberries. They're so good and my kids love them. I appreciate the fact that you get fruit and a vegetable in one go. Tempted to try adding some zucchini too just to increase nutrients a bit. I tried this recipe two months ago, and I've already made it twice more since then! My friends and I love these muffins. Each time, I have used 1 cup all-purpose flour and 1 cup whole wheat flour, and sliced almonds instead of walnuts. The first time I tried golden raisins, but I found I prefer KAF apple cinnamon jammy bits. One time I substituted the 3 eggs for 3/4 cup mashed banana to make the recipe vegan. This most recent time, I halved the amount of cinnamon and added some cloves and allspice - yum!!! 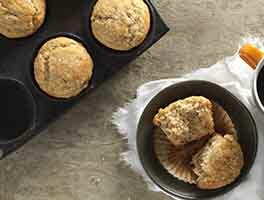 I can't recommend these muffins enough.